Once in a while a miracle happens when you least expect it, and a full spectrum of magic and wonder graces an enchanting evening. Such is the case on a cold winter Saturday evening when I walk into Kodama to find 3 place settings on the counter and the chef, Tsutomu Kodama, alone in his empty restaurant. 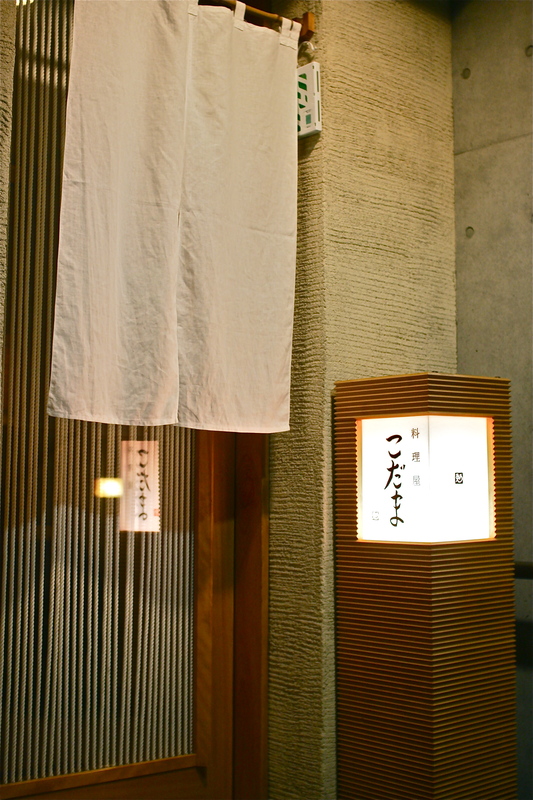 We are the only reservations for that evening- a rare occurrence at this highly acclaimed 2 Michelin star restaurant in Nishi Azabu- and the chef had sent all of his staff home. It is just the 3 of us and Chef Kodama with nothing to disturb our private tête-à-tête, an intimate experience that melds earnest conversation, cooking demonstration and delicious meal into one unforgettable night. There is a quiet confidence about Chef Kodama, one charged by passion and blanketed in humility, inspired by curiosity and illuminated with creativity. 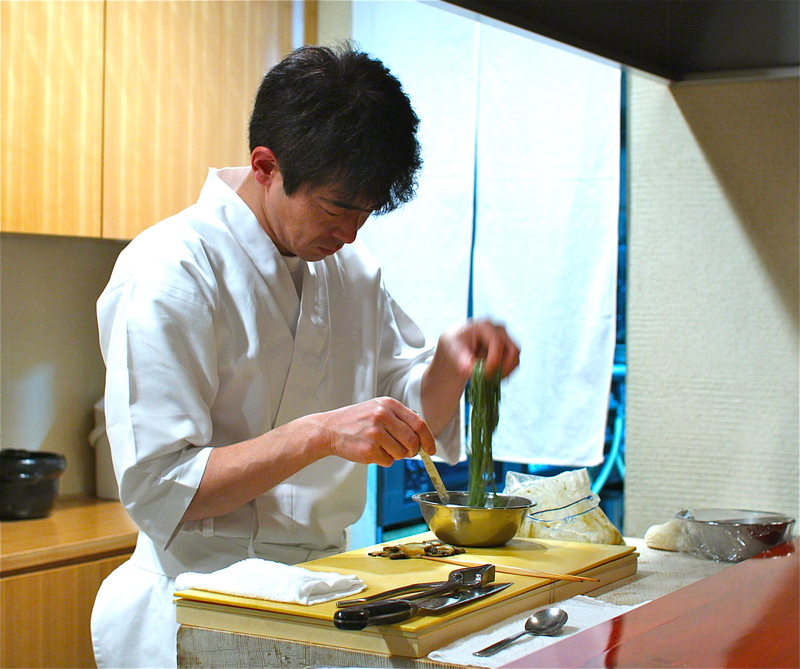 Having never apprenticed in a restaurant before, this young self-taught talent carries himself with the maturity and discipline of one who had been put through his fair share of rigorous kitchen trials under Japan’s notoriously daunting hierarchy. Perhaps it is this independence that makes him stand out from any other chef I have encountered- an honest, pure and relaxed approach to cooking- an untainted innocence almost. Or is this the beautiful consequence of our very private affair that we are blessed with this evening? ‘Good food should not weigh you down’ he says, as he prepares the first zensai course- a sincere intention that he puts into planning his meals, wanting to nourish his customer’s palates with well balanced seasonal ingredients, vibrant flavors and easily digestible garnishes without fatiguing the body. I appreciate his healthy purist approach to dining after experiencing one too many physically and mentally exhausting meals of gorging on thick sauces and extravagant fatty cuts of protein. This meal is emphatically different. A refreshing tossed salad of wild torafugu at its winter peak blossoms with bright stimulating flavors, its lacy black skin skillfully sliced into gelatinous slivers and its pearly white flesh prepared into tender paper-thin cuts. A strong yuzu aroma wafts through each successive bite that introduces delightful layers of titillating textures- the wonderful crunch of fugu skin and little pops of masago juxtaposed against a moist cushion of grated daikon. 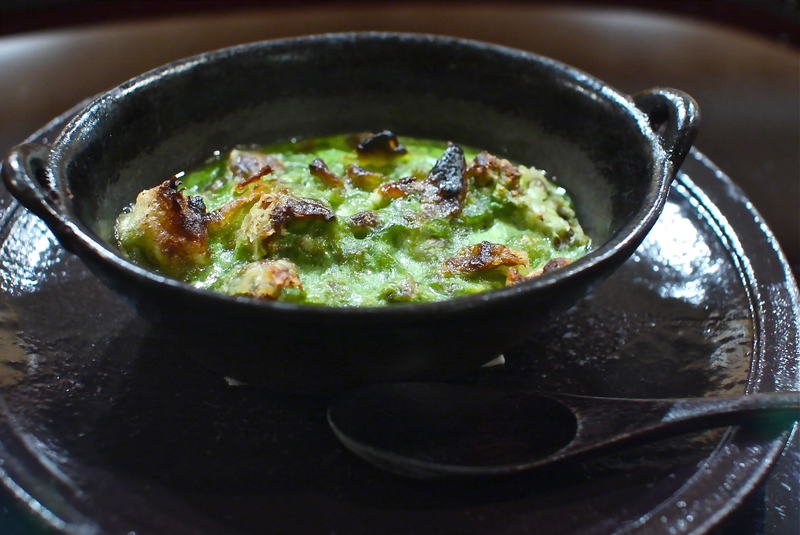 A vivid green fuki no tou (butterbur sprouts) gratin, still bubbling under the darkening crispy char on its surface, in a cast iron bowl- a calling of spring as forests and mountains awaken to the birth of a new season. A bright delicate bitterness fills my palate, just bordering on the verge of sweetness, as I savor every tender cut of warm butterbur coated in a luscious sauce made with little more than puréed butterbur. 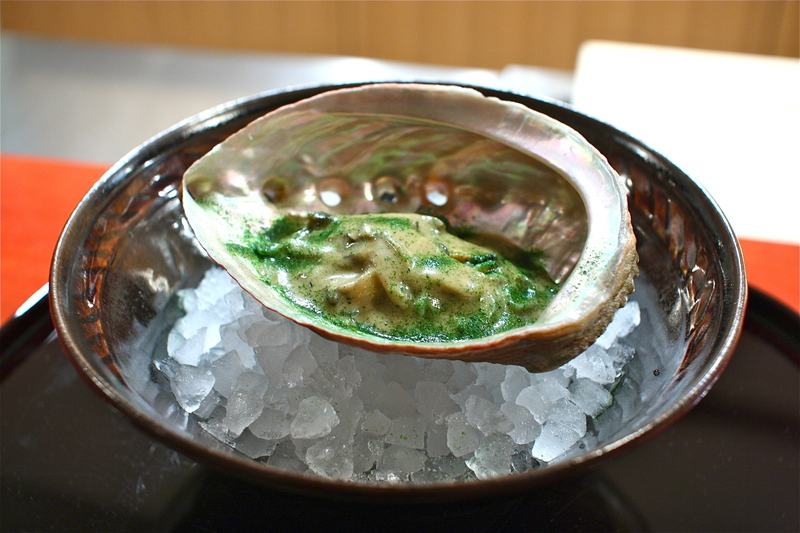 It is fantastic in its simplicity, a celebration of savory bitterness and a tribute to nature. It is with finesse and tenderness that Kodama handles his food, and the respect that he holds for his seasonal ingredients comes through in his creations. He does little to the flavors- such beautiful flavors are not to be tampered with- and instead plays with textures and form. Sashimi, in what would traditionally be served as the tsukuri course, is surprisingly difficult to digest, Kodama educates us. 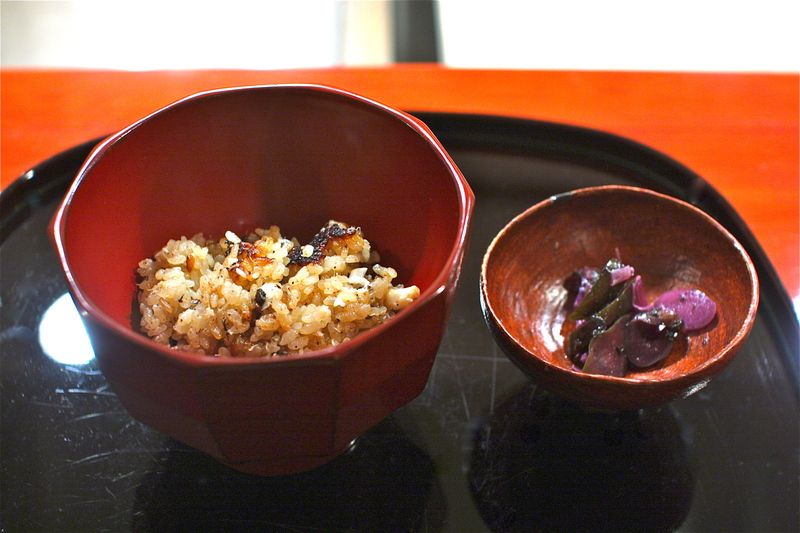 So he layers fresh slices of succulent sea bream on zakkoku rice mixed with black beans, sesame, barley and azuki. 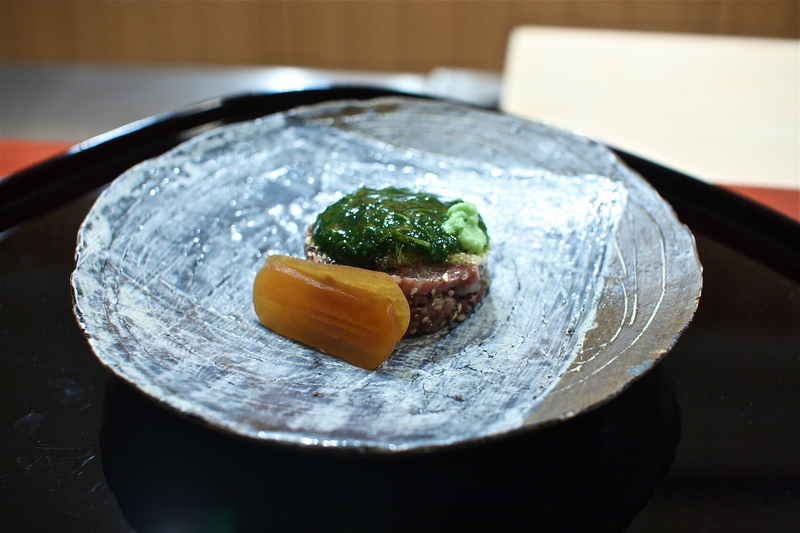 The grains, along with tobiko roe and a deep green seaweed sauce of a slimy consistency (in the most pleasurable manner) add a carnival of textures and flavors. Even the karasumi, Japanese bottarga, made in-house, is palatably low in sodium and full of roe flavor. I feel the nutrients permeate into my bloodstream and I sigh, ever so contently. This, I could eat every day. 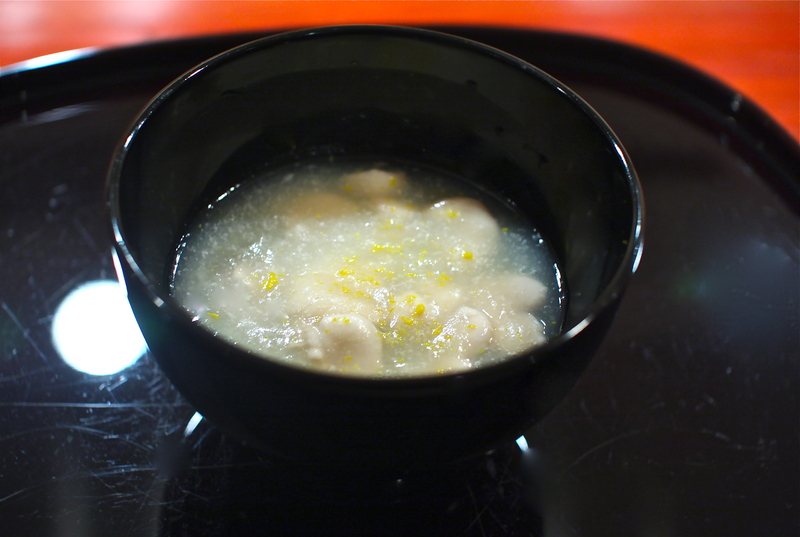 Rich creamy sacs of fugu shirako float in a lacquered bowl, suspended in a thick hearty broth of grated Shogoin kabura (large Kyoto turnips) seasoned with a touch of yuzu and ginger. The shirako bursts with its sweet milky sap, a tincture of heaven that elevates this comforting bowl of soup into a decadent and spectacular elixir. 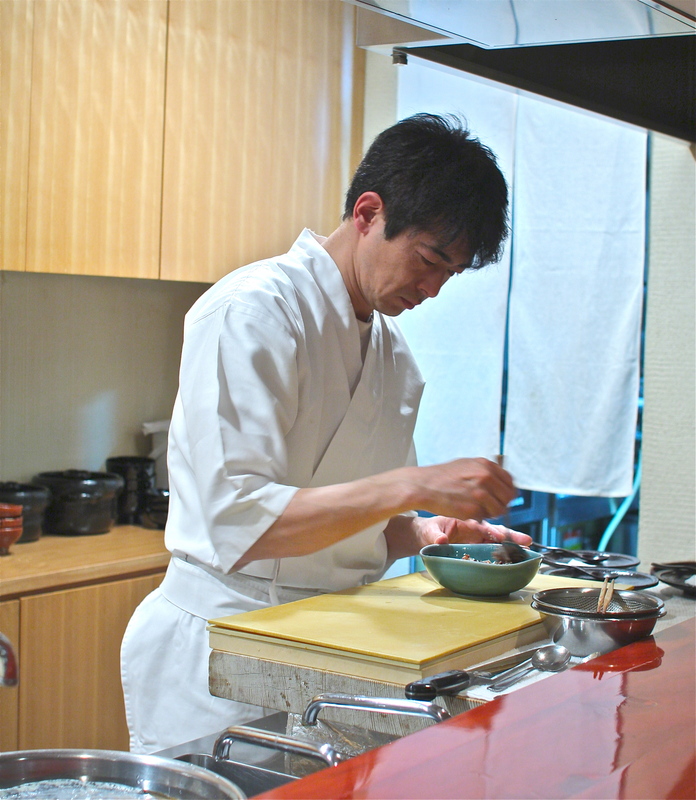 I realize with the next course that it has taken Chef Kodama years to prepare this meal. 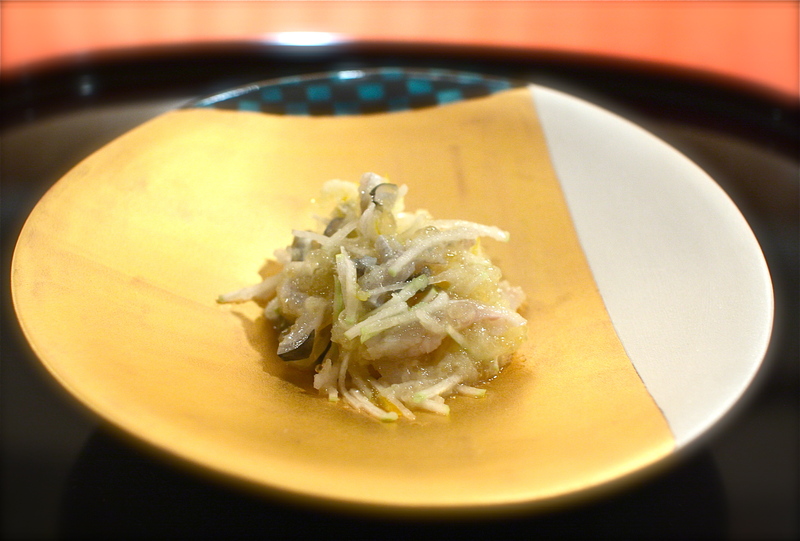 Days, of course, to prep each ravishing component of our meal- from the karasumi that at the very least requires 10 days, to the pickled vegetables that we will encounter in the finale- but decades to master precise skills for fugu butchering and soba making. 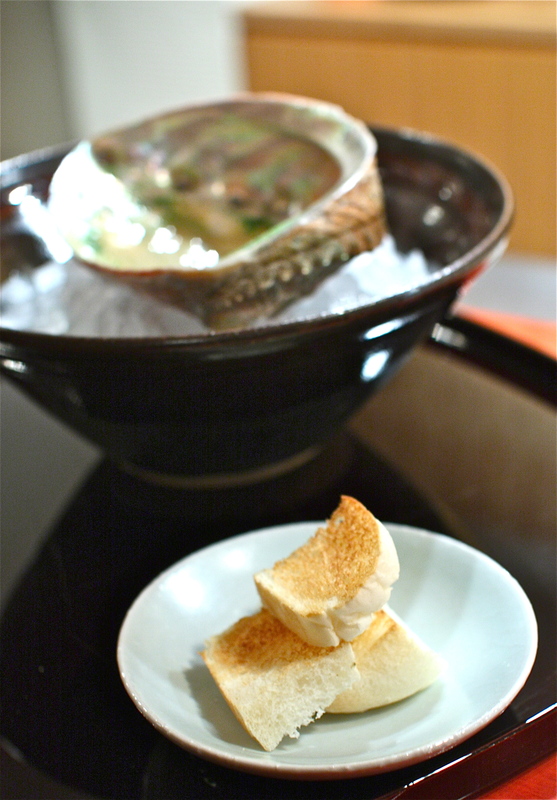 It is the abalone soba that first piqued my interest in Kodama and prompted me to make a reservation. It does not, unsurprisingly, disappoint. Elegant soba noodles, a brilliant matcha green hue, are mixed with seaweed and kneaded, rolled and cut by hand. Kodama’s soba, tossed with thin slices of tender abalone, glides effortlessly across my tongue, full of deep ocean aromas and a pleasant koshi texture. The phenomenal sauce made with abalone flesh and green innards that coats the noodles remains in the shell, and as if reading my mind, he hands me a plate of freshly baked rice flour bread, soft, plush and steaming with rich warmth, for me to lap up the sauce with. 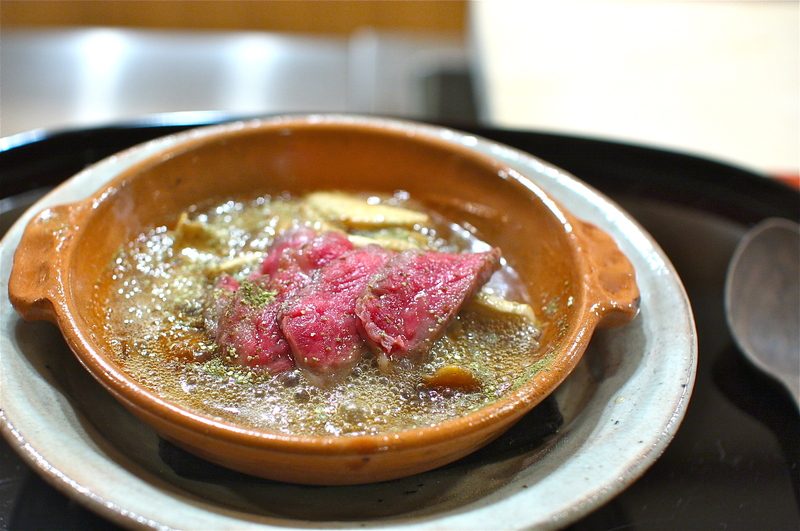 Marbled slices of tender wagyu rib eye cook slowly over a bubbling broth of earthy mushrooms and grated renkon loosely packed into airy fluffy manju. The bitter tang of powdered sansho keeps the heartiness of this divine dish in check where Kodama presents the beef not as the main course but as an exquisite garnish to highlight the beautifully prepared lotus root. Every course is an extension of Chef Kodama’s thought and intention, poignant haikus that paint the colors, flavors and aromas of the seasons- but it is the comfort and simplicity of the last savory course where his soul shines through. Homemade shibazuke, pickled cucumbers and eggplants, are especially crisp in texture, exploding with the brightness of ume and shiso flavors without the unpleasant saltiness that often weighs down commercial brands. It harmonizes with the tai-meshi, a warm serving of moist sea bream and crusts of burnt rice that have caramelized along the edges of the stone pot- the left overs of which he lovingly prepares into perfect little triangular onigiri for us to take home. Dessert is a revelation- I cannot remember, in all honesty, the last time I was ambushed by such originality and creativity in a sweets dish. Ice cream made with Junmai Daiginjo sake lees is creamy and rich with a waft of fruity aromatics unique to fermentation. 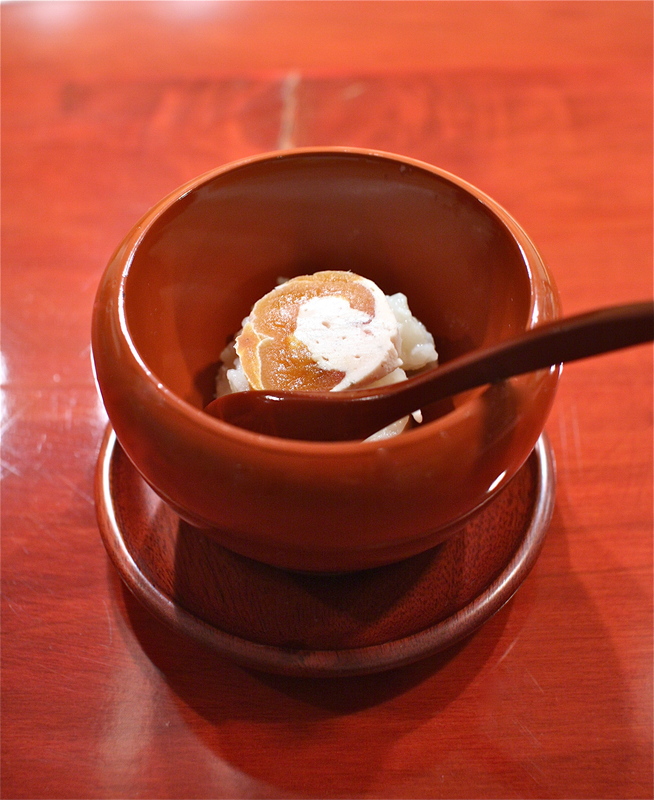 It is layered with an amazake gelée that lends a hint more of sweetness and on the very top, hoshigaki (dried persimmon) wrapped strawberry cream cheese that bursts with an intense honey sweetness, bringing it all to a climax. Kodama successfully and seemingly effortlessly integrates elegance, beauty and flavor into one unforgettable meal, from each ingredient that is carefully prepared with the diner’s health and well being in mind, to the lacquerware and ceramics that are designed by the chef himself in collaboration with local artisans. Thoughtfulness and attention to detail create a perfect balance- and on that night, I am given exclusive access to quietly coexist in that state of perfection. 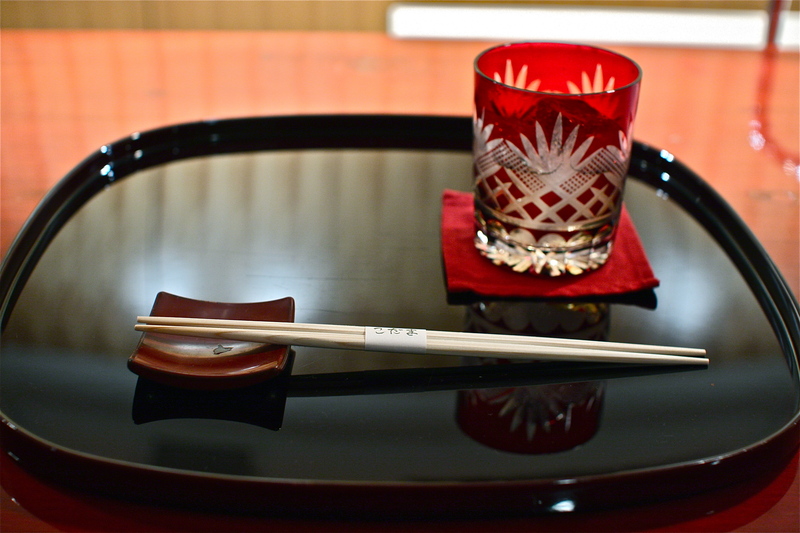 It is a sincere washoku experience where character and peacefulness preside over pretension. I bow in deep respect to this exceptional chef who has pampered me with an unforgettable private feast and I leave, smiling, riding high from this meal that has nourished my body and my soul to its very core. Random trivia: Sake lees, rich in amino acids, are highly praised by Japanese women for their beauty benefits. They are used in hand creams, facial packs and creams for their skin brightening and whitening effects.